Olympic history contains many stories of handicaps that champions have overcome but few can match the adversities Tommy Green faced before being crowned champion in one of the most gruelling events of the Olympic program. Because of rickets, he was unable to walk at all until he was five years old; in 1906 he falsified his age in order to join the Army but was invalided out of the Royal Hussars four years later as a result of injuries received when a horse fell on him. Then after being recalled with the Reserve in 1914, he was wounded three times and badly gassed while serving with the King’s Own Hussars in France. Green was first encouraged to take up walking by a war-blinded friend whom he had been helping to train for the St. Dunstan’s London-to-Brighton walk and in 1926, at the age of 32, Green won the first race he entered, a 12 mile race from Worthing-to-Brighton. Following this surprise victory he joined Belgrave Harriers and built up an impressive record in all the major road races. Green won the London-to-Brighton four times and was a six-time winner of both the Manchester to Blackpool and the Nottingham to Birmingham races. Other major successes included a win in the classic Milan 100 km. 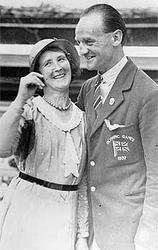 in 1930, a year which also saw him win the inaugural British 50 km. title. The only significant event that Green never managed to win was the National 20 miles championship, although he finished second on five occasions. Undoubtedly, the greatest of Tommy Green’s many triumphs was his victory in the 50 km. walk at the Los Angeles Olympics in 1932. After being troubled by the strong Californian sun he was at one stage one minute behind the leaders, but walking magnificently in the closing stages, he came through to win by more than seven minutes. At the age of 38 years and 126 days, Green is the oldest-ever winner of the event. In 1936 he made a great bid to make the Olympic team for a second time, but his fourth place in the RWA 50 km. was not quite good enough to earn him selection for the Berlin Games. After his checkered early life, Tommy Green held a variety of jobs before being employed at the Eastleigh Railway Works, where he demonstrated that accident-proneness is a continuing condition by losing a thumb in an industrial accident. On retiring from the railways, Green became a publican in Eastleigh and was a prominent figure in the local sporting world. Personal Bests: 20kmW – 1-38:45.3 (1933); 50kmW – 4-35:36.0 (1930).